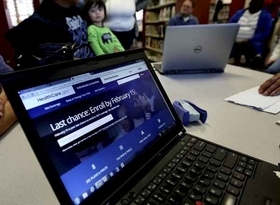 The HHS on Friday said the federally operated marketplace HealthCare.gov will be taken offline for 12 hours on almost every Sunday during the fifth open enrollment that kicks off Nov. 1. HealthCare.gov, which is used by individuals in 39 states to enroll in exchange coverage, will be inaccessible each Sunday between 12 a.m. and 12 p.m. ET, except on Dec. 10. The website will also be down overnight on Wednesday, Nov. 1, the first day of open enrollment . A CMS spokesperson said that maintenance outages are regular occurrences during open enrollment and are planned for times when HealthCare.gov experiences the lowest web traffic, which includes Sundays mornings. Actual outage times could be shorter than the times allowed for maintenance. But to some observers, the lengthy maintenance periods seem excessive and even meant to deliberately undermine the exchange. Additionally, the federal government has slashed marketing and outreach funds to $10 million, down from $100 million. The administration also drastically cut grants provided to "navigators" who educate and help consumers enroll in coverage. Other scheduled HealthCare.gov downtimes have been shorter. For instance, the health insurance marketplace will be undergoing maintenance on Sept. 24, but the website will be offline only between 12 and 8 a.m. Eastern time—4 hours shorter than the times scheduled during open enrollment—according to an email sent from the marketplace to ACA enrollment assisters. One navigator said maintenance periods do not usually extend to midday. The scheduled downtime further squeezes the amount time consumers have to sign up for a 2018 exchange plan in an already shortened enrollment period. This year, open enrollment ends on Dec. 15. It normally lasts until Jan. 31.